ldsound.ru » The JLH Class-A Output Stage. Single-ended or push-pull? The JLH Class-A Output Stage. Single-ended or push-pull? I have been asked on a number of occasions if the output stage of the JLH Class-A is single-ended or pushpull. My usual reply has been “do you want the short or the long answer” and then, without waiting for a response to what was in any case a rhetorical question, I have proceeded to send the long one. This brief article may save me from having to write it again. Let's start off by defining what we mean by single-ended and push-pull when applied to the output stage of an audio amplifier. A single-ended stage has a single output device (or combination of devices eg a Darlington or Sziklai pair) which handles all of the signal. The stage must operate in Class-A and the peak output current is equal to the quiescent current. A push-pull output stage can operate in either Class-A or Class-B (where each transistor switches off for half the cycle). I will only consider the Class-A scenario. Two output devices (or combination of devices) are required and these are usually complementary types when BJTs or MOSFETs are being used. The circuit is arranged such that as one half of the output stage turns on more and delivers or accepts more current, the other half is turned off by a similar amount and its current is reduced. In this way, the current in the load is twice the current change in one half of the output stage and the peak output current, whilst maintaining Class-A operation, is equal to twice the quiescent current (not quite, but as near as dammit). The JLH output stage can be analyzed in various ways. Doug Self describes the circuit as push-pull, with Q2 as an emitter follower and Q1 acting as a voltage controlled current source. James Sugden offers a similar opinion "…. the output stage is more akin to the White cathode follower. The upper transistor is the 'driven' element acting as an emitter follower with the second device as the emitter load but driven again in such a manner to vary itself in a beneficial way." On the other hand, JLH himself opined in the 1996 article that, if matched devices were not available, it was better to use the transistor with the higher gain as Q1 so that the output circuit worked as an amplifier with an active collector load rather than an output emitter follower with an active emitter load. He later stated in an article in Electronics World (May 2000) that "….. my 10W Class-A circuit did not use a push-pull pair of output devices to provide the required low output impedance. Instead it used a 'Darlington pair' connected amplifier stage, comprising Q1 and Q3, driving Q2 as an active load." The statements in the last two paragraphs all seem to indicate a single 'driven' device (thus meeting the definition of single-ended) with an active emitter or collector load providing some push-pull action. This is similar in many respects to the Pass Aleph circuit which is single-ended with a modulated current source for the output MOSFET load. The main difference between the two is that the Aleph modulates the current source by way of the output current whereas the JLH does it via the input signal. However, now for an alternative view based on information published by Wireless World back in 1973. The output stage of the JLH is basically that shown in the following diagram. 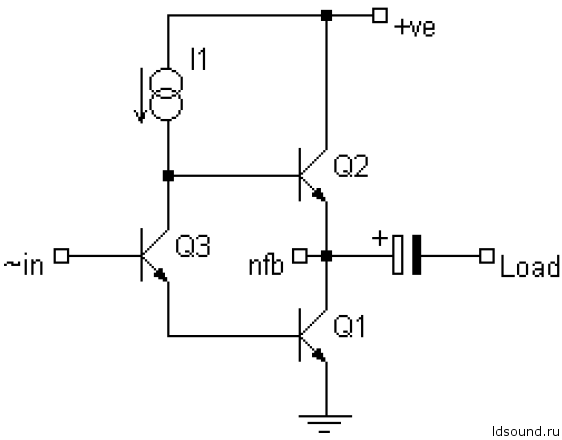 A constant current source feeds the junction of Q2b/Q3c. Assuming Q1 and Q2 are perfectly matched, with no signal present half the ccs output feeds in to the base of Q2 and the other half passes through Q3 into the base of Q1. The ccs current, coupled with the gain of Q1/Q2, determines the quiescent current of the output stage. When a signal is present at the base of Q3, Q3 will either pass more or less current depending on the polarity of the signal. If it turns on more, the current into the base of Q1 will increase. Because of the fixed ccs output, the current into the base of Q2 must decrease by a similar amount. The converse is true if the signal causes Q3 to pass less current. We therefore have an accurate current phase splitter and true pushpull working of Q1 and Q2 is achieved. If transistors were perfect devices, the push-pull action would enable the peak output current to equal twice the quiescent current. However they are not and Ic does not vary linearly with Ib, particularly when Vce is changing as well. This means that for a particular change in base current, the change in Ic of the transistor that has a reduced base current will be greater than the increase in Ic for the other transistor. Simulation has shown that the peak output current for the JLH will be between 1.3 and 1.55 times the quiescent current depending on the particular output transistors being used. So, what happens if the transistors are not perfectly matched? With no signal present, the base currents to Q1 and Q2 will not be equal (the ccs current will be split by the inverse ratio of the two gains). As I proved in one of my posts at the diyAudio forum, this limits the possible base current change for one of the output devices. At low signal levels this does not make much difference, the push-pull action is maintained, but as the signal level increases push-pull action ceases earlier than it would do with matched transistors. In fact it can be shown that, with a significant difference in gain between the two output transistors, the peak output current (in one direction) can equal (or even be less than) the quiescent current. If the peak (symmetrical) output current is equal to the quiescent current do we still have push-pull working? In reality, I doubt that any of these analyses or explanations is strictly accurate due to the complex interaction between Q1, Q2 and Q3 and the internal feedback around the loop formed by these three devices. However, suffice to say that this design produces very good sound quality so perhaps it is unnecessary to ponder too long on the intricacies and inner workings of the circuit.